HVFF was almost entirely dedicated to the CW’s superhero shows, Arrow and The Flash. Stephen Amell, John Barrowman, and a slew of stars from the shows had their own booths, with autograph and photo sessions throughout the weekend. There were a few actors from Once Upon a Time, as well as Karen Gillen from Doctor Who and Guardians of the Galaxy, and Agent Carter’s Hayley Atwell was meant to be in attendance, but sadly had to cancel. The convention was advertised as “It’s not your dad’s Comic Con - it’s your Fan Fest,” so I was curious as to how it would differentiate itself from other conventions. The prices were certainly no different from anything at Wizard World - $40-60 per autograph, around $100 per photo op - but there were two things I noticed that made a difference. The first was the panel stage. Instead of various panel rooms, they had one large stage in the main hall, where all the guest panels were held. To actually get a seat at those and to get to the mic to ask a question required a lot of waiting in line, but those who just wanted to watch from a distance could grab a seat and relax. The other was the children’s area, which had some bounce houses and a moon jump. It was a great added touch, giving the kids something unique, and a way to run around and have fun while their parents rested their weary feet. Additionally, there was an inflatable zipline that was open to all ages, and was certainly a nice added attraction to the con. Saturday was mostly spent scoping out the con. Check-in was very simple, and they allowed early check-in on Friday, so I was ready to go as soon as I arrived. Turnout was very nice, and the line for regular attendance had grown very lengthy by the time the doors opened. Inside, there were several rows of vendor tables, and in the back were rows of tables for the guests of honor. Lines began filling up quickly, but the staff managed them well. For those willing to spend extra for less time waiting, there were a few VIP options. Regular VIP had a priority line, but Gold VIP had even more priority than that. And if you were Platinum, well, forget the lines, they were allowed right to the front. I’m not entirely sure how much Platinum VIP cost, but I’m sure it wasn’t cheap. On the note of must-meet actors, I also found voice actress Nicki Rapp in a booth of her own at the con. I’ve said it before and I’ll say it again: she is one of the sweetest people ever, and absolutely radiates positivity. 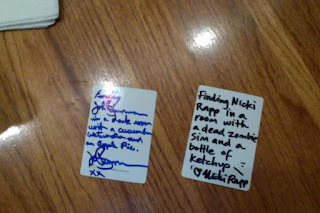 When I told her about what I was doing for autographs, she also signed a CAH card, and taking a cue from Barrowman, wrote “Finding Nicki Rapp in a room with a dead zombie Sim and a bottle of ketchup.” She also told me of this new show on Cartoon Network she’s a part of, Long Live the Royals, so I recommend checking it out. Perhaps the longest stretch of time I spent waiting that day was for Stephen Amell’s autograph. There were a lot of fans there to meet him, and his time was stretched thin, but I still managed to speak with him briefly (and may or may not have put my foot in my mouth at least twice in that short amount of time). With a few autographs in hand, and sore feet, it was time to wrap up the con. So, overall, I would say it was a fine convention. Like other Comic Cons, not for the short of cash, but it had some amazing guests that were definitely worth meeting. I look forward to seeing how it grows and stands out from the rest of the conventions in the area in future years. All magic comes at a price, dearie. In this case, the price is admission plus the guest's autograph prices.